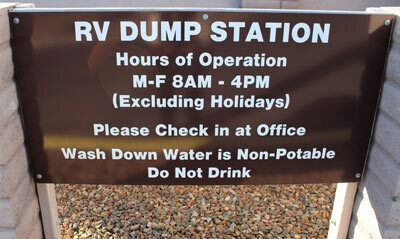 Recreational Vehicle (RV) waste is prohibited from being dumped directly into the sewer system. The District offers residents a place to dispose of their RV waste at the RV dump station located adjacent to the District office, at 16941 East Pepperwood Circle, Fountain Hills, AZ 85268. There is no charge for Fountain Hills residents and a $5.00 charge for non-residents. There is a $25.00 fee for commercial entities. Waterborne waste must meet the requirements of District Rules and Regulations. Hours of Operation are Monday through Friday 8:00 am to 4:00 pm, excluding holidays.